PULUZ is specialized in products development and sales for accessories of Cameras and Camcorders. Providing the highly efficient and cost-effective products and the most satisfying service are our goats. Whether you are a first-time buyer or a seasoned professional customer, we are here to wait for you. If you have any question of our products and service, please feel free contact us. With your trust and support, we can do better and better. -- 12-month worry-free product guarantee and return/replacement within 30 days after receiving for every purchase from PULUZ. 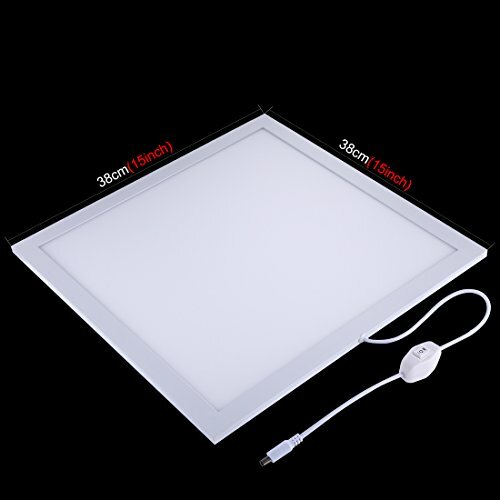 The Color Temperature is 6000K, and LED shadow-free light panel with 38 * 38cm / 15in * 15in effective area, bright and even illumination. It can be used with lightbox / softbox to sharpen outline of products and eliminate photography shadow problems. It is ideal for commercial objects shooting, such as jewelry, small toys, cosmetics, artworks, fashion accessories, etc. Adjustable brightness with switch control, simply a better way to find your ideal lighting.